1.1. The Afternoon Express Decorex Tickets Competition (Competition) will be run by Cardova Trading (Pty) Ltd in association with Decorex SA (Organisers/we/us/our). Entries for the Competition will open at 16h00 on Monday, 24 April 2017 and will close at 23h59 on Monday, 24 April 2017 (Competition Period). 4.1. SMS the keyword "DECOREX" followed by your name, surname and city to 33650 within the Competition Period. 5.1. We will randomly draw 10 (ten) persons (Winners) from all valid entries by means of an automated system within 48 (forty-eight) hours from the closing date of the Competition Period. Late entries will not be considered. 5.2. We will contact the Winner within 3 (three) days from the prize draw on the cell phone numbers from which the entries were sent. If a Winner is not contactable within 3 (three) days from the prize draw, and after we have made at least 3 (three) attempts to contact the Winner, that Winner will forfeit the prize and we shall have the right to select a different Winner on the same conditions except that we shall only be required to make 1 (one) attempt to contact each further Winner drawn. 5.3. The Winner will be required to provide a copy of his/her Identification Document as required in terms of the Consumer Protection Act, 68 of 2008. If the Winner fails to provide a copy of his/her Identification Document within 1 (one) day from being requested to do so, the Winner will forfeit the Prize and shall have no claim against us. 6.1. 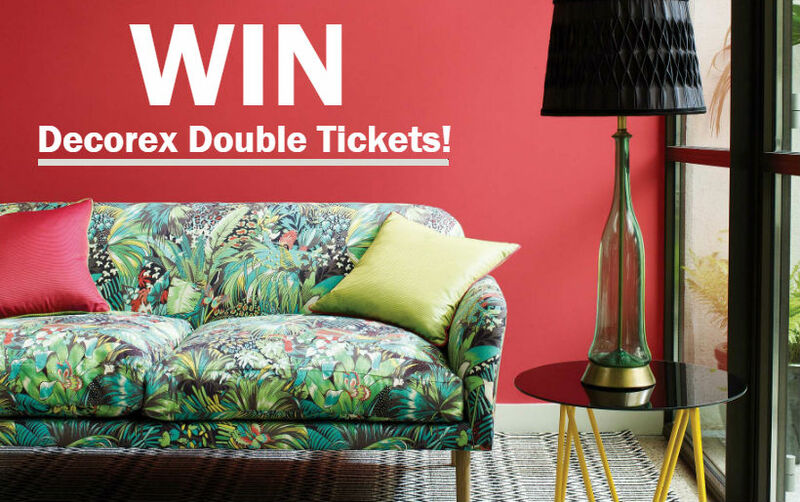 Each Winner will receive tickets for 2 (two) persons to attend any 1 (one) day of at the Decorex Cape Town Exhibition between 27 and 30 April 2017 (Prize/Tickets). The use of the Tickets will be subject to standard terms and conditions for admission to the Decorex Cape Town Exhibition as promulgated by Decorex. 6.2. The Prize is limited to the Tickets only and excludes all items not mentioned in clause 6.1. 6.3. The Winners will be required to collect the Tickets at the VIP counter at the entrance of the Decorex Cape Town Exhibition between 27 and 30 April 2017. 7.1. Any reference to the organisers includes the directors, members, partners, agents or consultants of the organisers, where the context allows for it. 7.4. We reserve the right to amend these terms and conditions within the Competition Period should it be deemed necessary in our sole and unfettered discretion. 7.7. We reserve the right to amend these terms and conditions during the Competition Period at our sole and unfettered discretion should we deem it necessary for any reason. 7.8. We will need to process your personal information to validate your entry, to contact you for marketing purposes, as well as to contact you, if you are a Winner, to make the Prize available to you. By entering this Competition, you specifically and expressly consent to us processing your personal information for these purposes. 7.9. We assume no risk and/or liability whatsoever for the failure of any technical element in the Competition which may result in your entry not being successfully submitted and/or the Winner not successfully receiving or taking up the Prize. 7.10. Once the Winners accept the Prize, such Winners accept such Prize voetstoots and at their own risk. 7.11. We assume no liability whatsoever for any direct or indirect loss, harm or damage arising from your participation and/or any use of the Prize awarded in terms of the Competition. All persons, entering this Competition, indemnify and hold us harmless for any loss, damage, harm, death or injury (whether arising from negligence or otherwise) which may be sustained as a result of his/her participation in this Competition and/or his/her use of the Prize, or the use of the Prize by a third party. 7.12. If required by the Minister of Trade and Industry, the National Consumer Commission or for whatever other reason, we will have the right to modify or terminate this Competition with immediate effect and without notice of such modification or termination. In such event, all entrants hereby waive any rights, which they may have against us and hereby acknowledge that they will have no recourse or claim of any nature whatsoever against us.